Zion National Park (NPS.gov/zion) draws millions of visitors per year from around the world with its beautiful views and classic hikes like Angels Landing, the Narrows and the Subway. Hiking, biking, canyoneering, backpacking, climbing or enjoying the water features are activities that will bring out the adventurous nature in anyone. For those who want a relaxing getaway in a beautiful setting, Zion is still the place to be, thanks to the charming little town of Springdale that sits just outside the park. It has a number of hotel and dining options that give you convenient access to the park for easy hikes like the one-mile Emerald Pools, as well as carefree biking where you won’t have to dodge cars (during peak months, only shuttles are typically allowed in the park). The town of Springdale has a variety of accommodations, ranging from boutique hotels to chain motels to bed & breakfasts. It’s just a matter of deciding what you’re looking for. For easy access to the park, we tried the Cliffrose Lodge & Gardens (281 Zion Park Blvd., 800-243-8824, CliffroseLodge.com), which sits just 200 yards from the park entrance so you can just walk up and hop on the shuttle. You can go take in great views in the park, or you can simply walk out onto your patio or balcony and see the Virgin River running by the property below a red-rock cliff that seems to go straight up into the air. 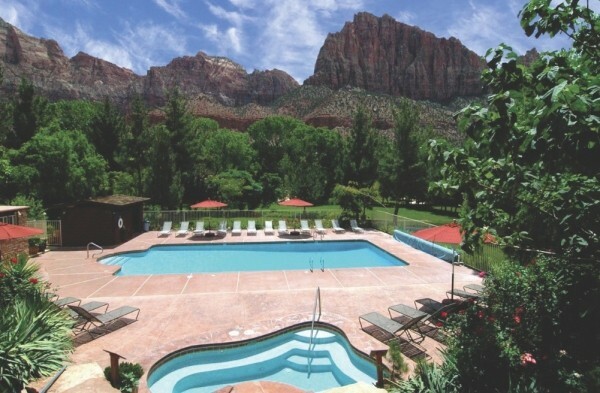 The Zion National Park Lodge (Zion National Park, 435-772-7700, ZionLodge.com) is one of the classic national-park historic hotels. Just being there gives one the sense of being in the center of the park, with stunning views no matter which way you turn. Options include hotel rooms, suites or 40 cabins, complete with a fireplace and front porch. If you want the complete back-to-nature experience, there are two camping spots less than a half-mile from the Springdale entrance. South Campground (Half-mile from south park entrance, 435-772-3256, NPS.gov) is a first-come, first-served option, while reservations are required for the 171 campsites at Watchman Campground (Fourth-mile from south park entrance, 877-444-6777, NPS.gov). Whatever combination of hiking and biking you want to have in the park, you can work it out to your exact liking with Zion Adventure Company’s (36 Lion Blvd., Springdale, 435-772-1001, ZionAdventures.com) Hike & Bike package. You’ll have a guide who can help you plan the perfect day, whether it involves taking short hikes that let you cool off in the water on a hot day, biking wherever you want through the park, or trying some more strenuous hikes with an expert to give you tips and information along the way. Zion Rock & Mountain Guides (1458 Zion Park Blvd., 435-772-3303, ZionRockGuides.com) specializes in rock climbing and canyoneering. While the rules limit guided trips somewhat within the park, the surrounding area is filled with all sorts of canyons to explore. Try a guided technical hike through Yankee Doodle Canyon that includes rappelling down on a line, shimmying through tight spaces and marveling when you look up and see red rocks surrounding you. Both outfitters, and others in the area, also offer a variety of other options such as mountain biking, Jeep tours and family adventures. One of the most popular things to do in the park is a hike through the Narrows, and both Zion Adventure Company and Zion Rock & Mountain Guides have ways to help you get through it. Commercial guide companies are only allowed to take you part of the way through, but they’ve got expert advice—and, more importantly, special shoes and outerwear that will help you walk through chest-high water across large rocks on this 16-mile hike. Restaurants and diners line Zion Park Boulevard as you go through town on the way to the park. The most well-known is Oscar’s Cafe (948 Zion Park Blvd., Springdale, 435-772-3232, CafeOscars.com), where dishes like Hank’s Horseshoe—a breakfast concoction with toast and potatoes baked in a bowl, then topped with any breakfast item you can think of—inspires such devotion that when we were recently there, the place was packed, with a hefty waiting list for seats. In the mid-afternoon. During shoulder season. Wildcat Willies Ranch Grill & Saloon (897 Zion Park Blvd., Springdale, 435-772-0115, WildcatWillies.com) serves breakfast until 1:30 p.m. to accommodate late risers—who may be getting up late because they spent the previous evening at Willie’s having a beer, singing karaoke and dining on buffalo meatloaf. Whether you want to explore the Narrows or how relaxed you can get for a weekend, or find your perfect balance somewhere in between, Zion National Park and the town of Springdale can let you do whatever you want—but always within view of those world-famous cliffs. Kathleen Curry and Geoff Griffin blog as the Travel Tramps on CityWeekly.net and host the weekly Travel Brigade Radio Show.